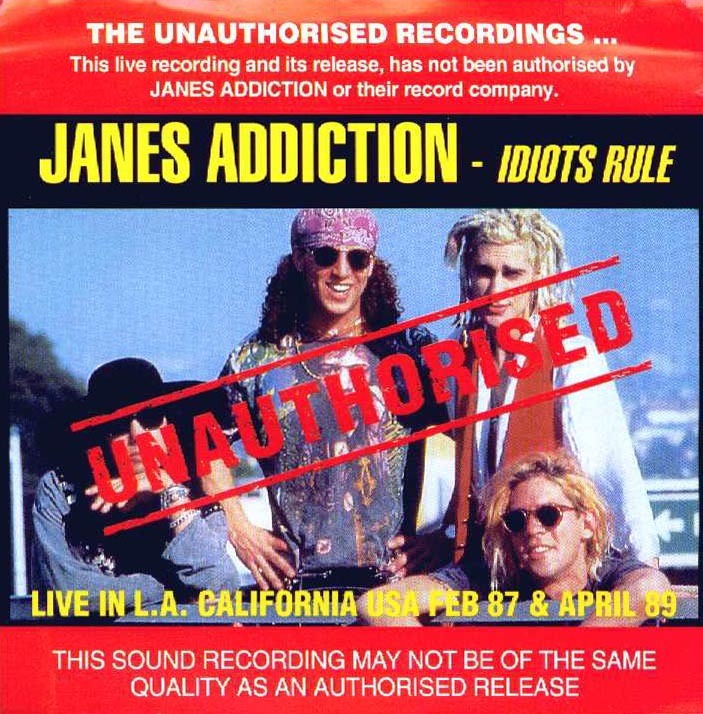 Idiots Rule (v3) is an Australian silverback CD bootleg from Grapefruit Productions. It is volume 1 of a bootleg set, the second volume being Been Caught Stealing. This version pairs a set of popular old Jane’s Addiction concerts. The first is the November 13, 1986 show at The Pyramid in Hollywood, Los Angeles, CA. The last half of this disc uses the April 28, 1989 show at the John Anson Ford Theatre in Hollywood, Los Angeles, CA. This disc makes it well known that it is an unauthorized recording, which was done apparently to get around local copyright laws. This disc comes with no additional artwork and is nearly identical to the Idiots Rule (Vol. 1) bootleg by Apple House / Banana.